Darren reports that yesterday, Thursday 12th January, around 3pm, a skein of about 80 Pinkfeet geese flew over the Park, heading north northwest. The same birds were then seen at Barden Scale, Bolton Abbey at about 3.30pm. The pink-footed goose (Anser Brachyrhynchus), does not breed in the UK, but over-winters here in places like Norfolk and Lancashire, before returning ‘home’ to Spitzbergen, Iceland and Greenland. Darren’s conclusions are that Parkinson’s Park appears to be on a migration flyway. So, expect more wonderful V formations in the coming months. 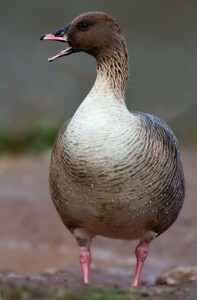 This entry was posted in Bird Watch, Ecology and tagged Bird Watch, Pink Footed Goose. Bookmark the permalink.